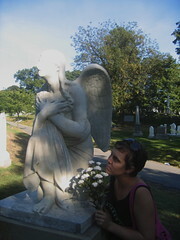 Jennifer and I spend a lovely, sunny Sunday strolling about historic Green-Wood cemetary, a mere 20 blocks from my home! I made a set on flickr called “Cemetary Gates.” I realized I always compare Green-Wood to Pere La Chaise in Paris. This is probably wrong, as Brooklyn is not Paris and Paris is not Brooklyn. However, I feel like I need to have some kind of reminder of Paris in my days. Nevertheless, Green-Wood shines in its own right and I want to write a longer essay on it one of these days. This entry was posted in Brooklyn and tagged Uncategorized. Bookmark the permalink.